I don't know. I usually like Ping stuff. I'm always a little bit weirded out by the extra large sole on these club heads, but for some reason on other clubs like the Ping i15 irons, I didn't mind. On the G15s, it really threw me. When I honestly looked, they really didn't look too different, but I can't deny the fact that I simply did not like the G15s at address. The club is awfully bulky looking. I feel like I’m holding a lacrosse stick. The back of the club is ugly as well. Ping has tried to make the club look modern. They may have accomplished that, but it’s still ugly. I mean a Prius Hybrid car looks modern, but it’s still one of the ugliest cars on the road. The idea behind the technology is to design a very large forgiving face with more MOI than any of their predecessors. The face as I already mentioned is huge. There is one white line on the bottom. I’m not sure of the point on that brilliant idea. It looks random and doesn’t fit. The club has an offset to help with closing the face at impact. One thing that will help cure your slice. That is not a bad thing. Perhaps if it did that I could overlook the hideous look of it. If you CAN get used to the look and you are looking for a game improving iron you might like the technology used with the floating Custom Tuning Port. It is suppose to be incredible, and the center of gravity is one of the lowest in all of golf. The COG is very deep and low which makes it much easier to get the ball airborne. It also helps with mishits towards the bottom of the club. Perhaps this is why the white line is on the bottom. Ping is trying to say, “don’t worry about low mishits!” If it were me, I would have made it red with a big bull’s eye on the bottom. (If you are going for ugly, go all the way.) In addition the low weight allows Ping to increase the launch angle, for higher flying ball. And last but not least, it helps the club get down through the rough and “ensures a smooth transition through the turf. This would be a good club for you high handicappers or those of you that are just getting into the game. The custom tuning port (CTP) means the scientists at Ping made the face even thinner and moved all the weight to the perimeter, in particular the toe. This means off center hits, still fly far and the higher MOI keeps the club from twisting. 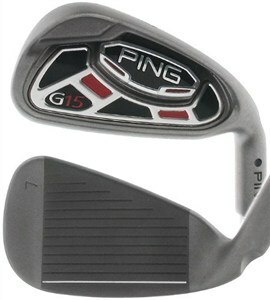 Ping has been making such good clubs for so long that they really have it together. As I think back on some of the good experiences I had with Ping irons, it may have been the need to have a custom fitted iron like the "i" series.